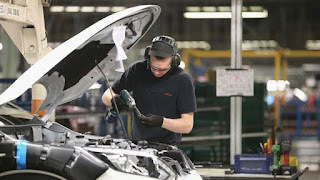 Growth in the UK's manufacturing sector accelerated last month, according to a closely watched survey, with output, orders and employment all picking up. The Markit/CIPS purchasing managers' index (PMI) for manufacturing rose to 56.9 in August from 55.3 in July. A figure above 50 indicates expansion. The PMI reading was the second highest for more than three years. Rob Dobson from Markit said the sector continued to show signs of "solid progress". He said it was increasingly likely that growth in the sector would be maintained "given the breadth of the expansion", with both big and small companies seeing conditions improve. "The survey data suggest that the manufacturing economy remains in good health despite Brexit uncertainty, and should help support on-going growth in the economy in the third quarter, which will add fuel to hawkish policymakers' calls for higher interest rates."